Note: A quick note regarding an event that didn’t make the list above. Many of us remember the March 6, 2008 event when a very narrow swath of heavy, convective snow fell roughly 20 to 30 miles either side of line from Eastland to Denton to Sherman. Parts of northern Tarrant County had up to 5 inches of snow, with 5 to 7 inches in Wise/Denton Counties, and 7 to 12 inches in Cooke/Grayson Counties (the heaviest was over Sherman). 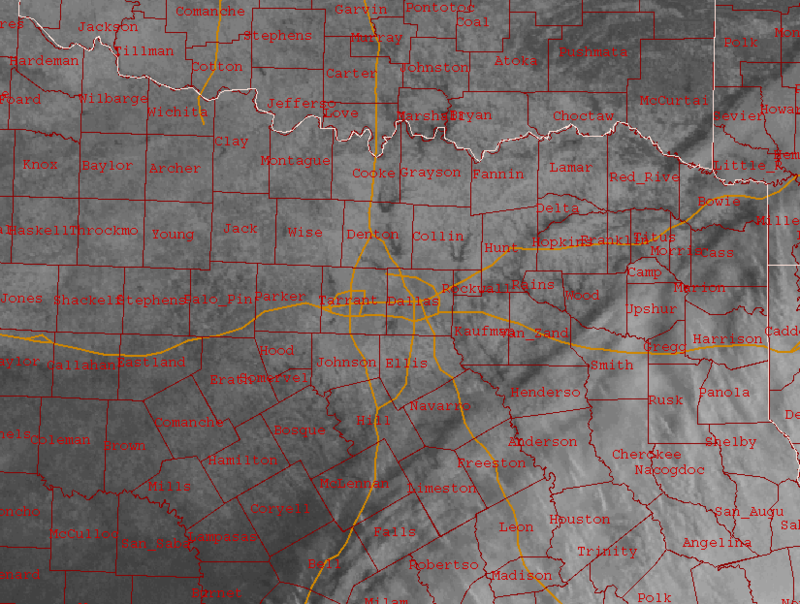 Despite how close that band was to the metroplex, DFW recorded only 1.1 inches. How Much Fell in Your Town? Beneath the satellite image below are the official reports which have been screened by the NWS. I’m surprised that there weren’t more freezing rain reports, because freezing rain was certainly the initial precipitation type after the temperature fell below freezing Wednesday afternoon (March 4). Rain began to freeze to trees, power lines, and other elevated surfaces. During the evening hours, sleet became predominant before changing to very heavy snow around 11 pm. I guess most people in North Texas were reporting only the snow, which was quite impressive to say the least. 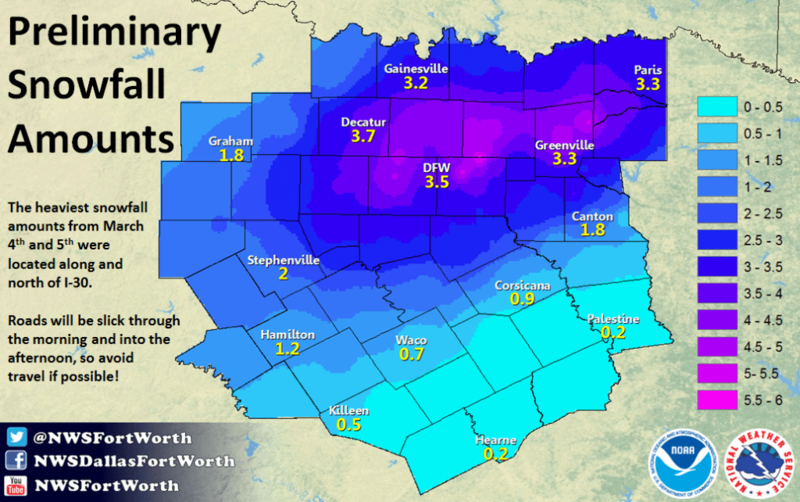 Initial snowfall rates were around 3 inches per hour at the peak of the event (10:30 west of Fort Worth to Denton, spreading into D/FW around 11 pm). I measured one inch of snow in the first 20 minutes at my location in Southlake. The NWS in Fort Worth measured about 1.3 inches in the first 30 minutes. Snowfall rates this high require the perfect combination of dynamics and microphysical processes, and is a very rare event in North Texas. Imagine how much we might’ve seen had the storm system not been moving so quickly. The snowfall lasted about 3 hours, but the very rapid snowfall rates (2 to 3 inches per hour) lasted only about one hour at any particular location. 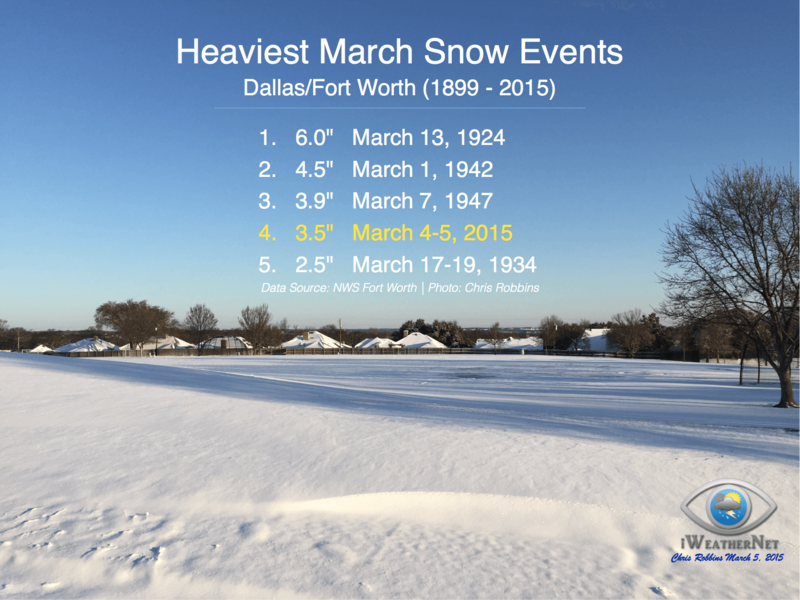 Despite the relatively short duration of this event, the rapid snowfall rates ultimately made this a record-setting storm to remember, placing it among the biggest snowfalls ever measured at D/FW this late in the season. Note: All accumulation reports within each precipitation-type group are sorted first by county then by amount. This is the visible satellite animation from 8 am through 5 pm (CST) on March 5, 2015 showing the snow as it melts. Toward the end of the animation, you can get a better idea of where the heaviest snow and sleet accumulations were since they were deeper and take a bit longer to melt.